As each holiday approaches, it gives us the chance to find our inner child and have some fun soaking in the nostalgia of celebrating the day. Remember when you were a kid and it was so exciting to be someone’s Valentine? Or how you exchanged Valentine’s with the 25 other children in your classroom? Just because you’re all grown up, doesn’t mean you can’t indulge in a holiday and get all themed-out. We may not be able to send all of you valentines with little chocolates attached so we’ve made this fun Valentine name game for you and your one true Valentine, your dog! 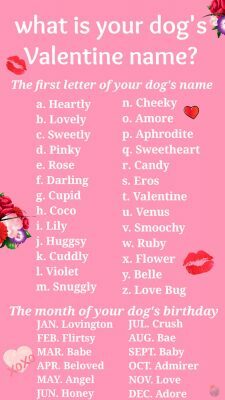 Take the first letter of your dog’s name and match it up with the corresponding Valentine name. Then take your dog’s birth month and match it up with the second corresponding Valentine name. Pair up the two and you’ve got your dog’s Valentine name! Our dog’s name is Teddy and he was born in the month of May. So his name is Valentine Angel! So sweet!